Go with the flow is one of my favorite sayings to keep at heart and to live by whoever and wherever you are. Times change, and whether we like it or not, we need to adapt to them. Traditions are all fine and good, but when you swim against the strong currents of time and against reality, you will be washed away to a far-away deserted island. By this, I do not mean that one should throw all traditions and old-fashioned ideas to the wind, but the digital age is creeping up behind us; we could be staunch and adamant and go against technological progress Amish-style, or we can see its many benefits and embrace its practical side, regardless of our own ideology. I will give a concrete example here. For the longest time, I withheld, or at least tried to withstand, the onslaught of technology. I saw it as a threat to my romantic and idealistic beliefs. 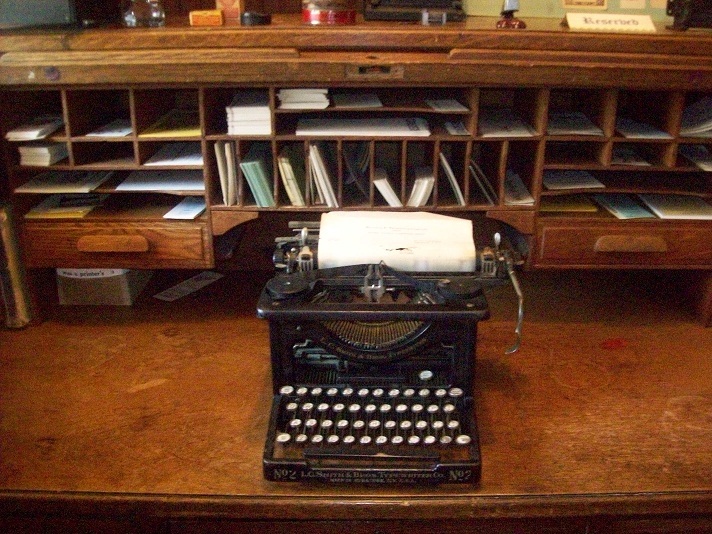 I held hard and desperately onto my mechanical typewriter; I resisted the urge to sign up for a credit card and stayed away from any other technological gadgets in use and the fashion of the times. 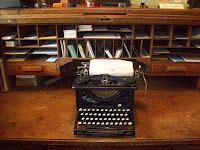 When I was slowly and ardently typing away on my heavy-set typewriter, I felt a strong connection with writers and poets of the past. And then I would get upset over my lack of attention, coordination or communication between mind, eye and finger leading to a more than occasional typo in my text. Out comes the white correcting fluid, which I disliked using. Soon enough the whole page would be riddled with white, so there went another page crumpled up in anger into the brimming paper-basket. When you make mistakes on typewriters, no matter how good your liquid, it shows. The whole writing process slows down significantly especially when your keys sometimes get tangled up or, God forbid, become unresponsive or even break. Then I switched over to the word processor, where I can do these amazing things like delete words without anybody noticing, and copying and pasting paragraphs to my heart's desire. Spell-checks and the thesaurus are your friends not enemies, and you save paper and physical space by saving all your files on your computer. Everything tidy in one place under its own marked folder. Thank you, computer, how could I ever manage to live without you! I realized along the way that cellphones are useful as they help me communicate with loved ones anytime and anyplace (as long as there is reception) and that credit cards make it much easier to buy stuff over the Internet; at the same time, I can start building my credentials and ratings with possible future mortgage lenders. I am aware that I am still quite far behind as I do not have the comfort of i-phones where any answer is only a click or touch away and where I could check my emails more often than I do anyhow. And I do feel that I am falling behind already as my nearly four-year-old son is probably more proficient with his iPad than I am. To my defense, not all technology is a good idea and time has given some gadgets the slip. It is with glee that I remember a pretty useless invention that I withstood at the time, namely the beeper. You pay money to know that somebody somewhere called you, so now off to the phone to see who it was and what they wanted. Some friends would show off; with hindsight I laugh at any person who ever owned such a worthless device. Sorry if I have offended anybody here. No doubt, technology has come to define us and our way of thinking. Nowadays children and youth take these inventions for granted and think their world without these gadgets unthinkable. Their minds may be more easily distracted, but they are also shaped with certain skills that we never used in the past. Where we used to struggle to log into our email accounts, the kids these days can do acrobatic things with technology, something that gains and deserves my full respect. (I am also impressed with the young hackers out there that manage to breach security procedures set up by “adult” professionals). How does all this affect our society? I will discuss two ways here. First, the point I made earlier. If you keep resisting the winds of change, you end up isolating yourself and you lose out. Everything is becoming digital and you are referred to websites for forms and applications. Your cashier at the store or library is now a computer and when you call for assistance, help or information, you will most likely stumble upon automatic recordings that lead you to a website (Where is the human touch in all of this?). The second point is the mindset on an issue that is becoming a thorn in the back of the music and film industry, the issue of piracy and illegal downloading. They have tried to stop this activity by shutting off sites like Napster and yet similar sites are popping up all over the place. The new laws that target piracy are greeted with downright hostility by the general public. In the modern mind, piracy seems a normal and commonplace thing to do, the same way pirate radios used to be the answer to the stale, sanitized and highly controlled radio programs in the past when rock 'n' roll was considered a vice. I do believe, at least theoretically, that piracy is an unethical practice. The reason is that it comes with a general disregard for intellectual ownership, property and copyrights. A writer, musician or film-maker spends a lot of time and effort on their work and to see it downloaded without receiving a dime for their efforts must feel frustrating, to say the least. It is a form of stealing, to take that which is not yours without giving anything in return, despite the fact that after downloading, you are technically “sharing” your files with others. But in reality, there are other things to consider as well. Why does illegal downloading exist in the first place? Sure, there are many freeloaders and parasites out there, but that is not the full issue here. In the past, I used to save up a long time to be able to buy a CD or DVD. It used to be a significant event for me to come home with new music or the most recently released films. Yet I believe that it was indeed quite expensive. A CD or DVD could cost me as much as 50 dollars and considering a minimum wage of 7 dollars that is quite a bit (more than five hours of work!). That is my complaint against the music and film industry that their prices were unreasonable, unrealistic and unfair. Back then, they made a lot of money from us consumers. I look at my CD collection and think how much money has been spent every year on music alone. So now that there is the option of downloading music, or specific songs for free, most people take advantage, and supposedly in Canada we are number one on this list, at least on a per capita basis. Now it is the music and film industry that need to adapt to the times. This is the digital age and things have changed. So it is necessary for them to adjust and perhaps offer legal downloading. To an extent, Netflix has been doing that, and they have been, to my knowledge rather successful. Yet when I look at others like iTunes, the costs for songs and movies are still very high. Because of this discrepancy, most of us will throw ethical considerations to the wind and prefer to save money instead. I am certain that once the price is reduced and becomes a more reasonable rate, more people will jump aboard and away from those black-toothed pirates. Let us now look at the arguments against illegal downloading. The entertainment industry claims that they are losing money. That is a true and obvious fact. DVD rentals have shut down. Many businesses that used to bloom are suffering as a result. No business can last forever and it is time for them to jump ship and turn to more profitable business, as demand has changed. Beepers have gone out of business too, and nobody is crying over a loss of income in that case. Another consequence and case in point is that the artists will not get their cut and are suffering and losing out in this process. This is a more resonant and stronger argument, but it overlooks some crucial facts. First, struggling musicians have and will always struggle, with or without piracy. Record companies have notoriously paid them as little as possible. In fact, illegal downloading actually benefits those struggling musicians. They can get their music out at no cost for the consumer. It is easier to check out music that is free than having to think twice about paying money for it. In that way, their music will be heard, and if people like the band, they will consider seeing them live perhaps. When it comes to movies, the situation is slightly different, but again my sympathies lie with the downloading public again. The costs are too high still. And I am not so much worried about actors that can make anywhere between five to twenty million dollars per movie. In order to decrease the loss of the movie industry, why not cut down on their salaries or, on the part of actors, why not accept a pay-cut and do it for the love of the industry? A similar issue can be raised with the current NHL lock-out. With all due respect toward the players bargaining for the best possible deal, just accept a pay-cut - it is not like they get starving or low wages - and simply agree to play for the love of the game. In the end, those who suffer and lose out the most are the loyal fans and viewers. They are the ones who truly embrace and love the sport and are willing to spend their hard-earned dollars on their favorite teams. Here is my advice for all involved. Let us be fair. If the film and music industry make a true effort to offer reasonable prices, the public ought to refrain from illegal downloading and instead buy and pay for the original products. Tighter laws, fines and sanctions will only make things worse. Taking Youtube videos down for copyright violations only aggravates the public more; these means are like putting out fires here and there temporarily. But since these measures will not address the root of the issue, others will start the fire, and piracy and illegal downloading will never rest in peace nor be a thing of the past. As a point of information, the bleeper is still alive and well, at least in the hospital where my wife works. It's a speedy guaranteed way to contact key staff, as it is a disciplinary requirement for them to wear it whilst on duty. They may fail to respond - that's their judgement - but the caller can move on, knowing her job has been done correctly. As for status symbols, I note that the young doctors make sure to have their stethoscopes dangling negligently from a pocket, even when (or especially when) dining in the staff canteen. It wouldn't do to be mistaken for someone inferior, such as a nurse, or the husband of a department secretary (such as me). On your main point, I'm content to let musicians, lawyers, publishers and music fans sort it out between themselves. The important thing is to ensure that it remains the norm for young people to respect the law. If they don't we have anarchy. Therefore laws must be enforced or changed as necessary. But above all we the older generation must not tell our young that it's ok to disobey laws that they consider silly. Well, they were initially designed for hospital staff and yes, I can see their value there even today. Faster than text messaging and better than calls since you can choose to refuse. I had an interesting chat with a computer science instructor once where I wanted to know why most hackers are young. He told me because the older folks respect the law more. As to advice for youth, yes they should respect laws generally and I am generally against anarchy. However, some laws are in fact silly, outdated or unfair. What to do then, Vincent?